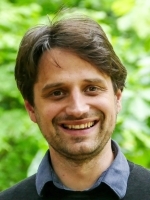 Simon Friederich is assistant professor of philosophy of science at the Faculty of Philosophy of the University of Groningen and at University College Groningen. Between 2012 and 2014 he substituted as professor of theoretical philosophy at the University of Göttingen after working as a postdoc in the research collaboration "Epistemology of the LHC" at the University of Wuppertal and as academic visitor at the University of Cambridge UK. Previously, he studied physics and philosophy in Göttingen and Lausanne. He was awarded a PhD in theoretical physics by the University of Heidelberg and a PhD in philosophy by the University of Bonn. His book "Interpreting Quantum Theory: A Therapeutic Approach" appeared in Palgrave Macmillan's "New Directions in the Philosophy of Science" series in 2014. Simon's research interests are in the philosophy of science (causation, explanation, probability), the foundations of physics (interpretation of quantum theory, symmetries, particle physics, philosophy of cosmology), the philosophy of mathematics (Wittgenstein, structuralism) and epistemology (in particular self-locating belief). Much of his current work focuses on epistemological challenges within multiverse cosmology.